In a study exploring racial bias and how people use their mind’s-eye image of an imagined person’s size to represent someone as either threatening or high-status, UCLA researchers found that people envisioned men with stereotypically black names as bigger and more violent. The study, published today in the journal Evolution and Human Behavior, sought to understand how the human brain’s mechanism for interpreting social status evolved from the same mental systems that our early ancestors originally used to process threats. In a series of studies involving more than 1,500 people, the researchers found that an unknown black male is conceived of similarly to an unknown white male who has been convicted of assault. During one version of the study, the mostly white participants, aged 18 to mid-70s, from all over the United States and self-identifying as slightly left of center politically, read one of two nearly identical vignettes. 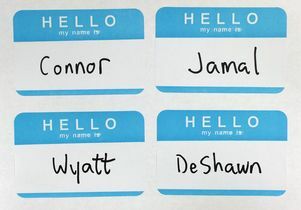 One featured a man named Jamal, DeShawn or Darnell, and the other featured Connor, Wyatt or Garrett — monikers selected based on prior research into names most commonly associated with various ethnic groups. In another version of the study, participants again read a vignette with one of the two types of names. A control group read the original “neutral” vignette. The other groups read the same vignette with one of two additions: a “successful” scenario in which the character was a college graduate and successful business owner, or a “threatening” scenario in which the character had been convicted of aggravated assault. In all versions of the study, participants were asked their intuitive impression of the character’s height, build, status, aggressiveness and other factors. Participants rated each character on height, muscularity and size, and the composite score for all three characteristics was statistically equivalent for the “black neutral” character and the “white criminal” character. Not only did participants envision the characters with black-sounding names as larger, even though the actual average height of black and white men in the United States is the same, but the researchers also found that size and status were linked in opposite ways depending on the assumed race of the characters. The larger the participants imagined the characters with “black”-sounding names, the lower they envisioned their financial success, social influence and respect in their community. 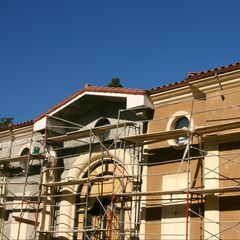 Conversely, the larger they pictured those with “white”-sounding names, the greater they envisioned their status, said co-author and UCLA anthropology professor Daniel Fessler, director of the UCLA Center for Behavior, Evolution and Culture. The researchers have long been interested in what influences people’s perceptions of how physically formidable another person is. Their previous research found that marching in unison made men view opponents as smaller and less intimidating, and that opponents with a weapon were perceived as larger and stronger. The researchers chose to study how race played into people’s conceptions of size, status and aggressiveness after several highly controversial incidents nationwide in which unarmed black men were killed by authority figures or police. The killings raised serious questions of racism and sparked the “Black Lives Matter” movement. The study’s third co-author is Fessler’s former graduate student Carlos Navarrete, now an associate professor at Michigan State University. The study is part of a larger project funded by a grant from the U.S. Air Force Office of Scientific Research to understand how people make decisions in situations where violent conflict is a possibility. 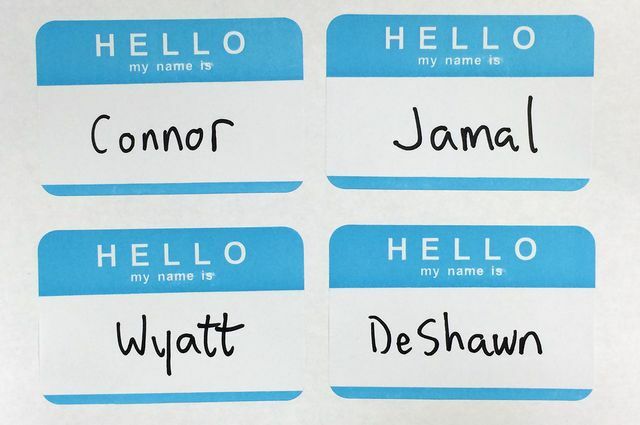 Four name tags with the names Connor, Wyatt, Jamal and DeShawn.